Georgian architect Dachi Papuashvili just unveiled plans for a cross-shaped micro residence built from two overlapping shipping containers. The tiny, four-story house is envisioned as a temporary retreat built from waste construction materials. 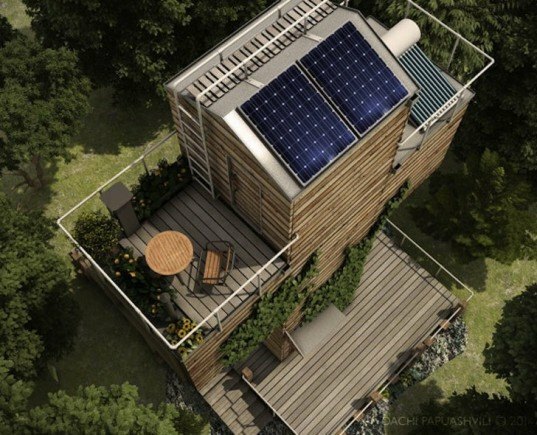 The compact structure is designed to operate entirely off-grid, and it's equipped with self-sufficient features such as solar panels and a composting toilet. Built to house a single occupant at a time, the micro house offers a full suite of amenities in a compact energy-efficient space. The wood-clad shipping container structure can be prefabricated off-site to minimize site disturbance. Papuashvili’s design is self-contained and self-sufficient to provide its tenant with a high degree of solitude. The off-grid building is equipped with solar panels to power the home as well as a rainwater catchment system. The first floor is reserved for utilities, including solar energy batteries, a water reservoir, and additional storage space. A bathroom with a shower and composting toilet is located on the second level. The horizontally-oriented shipping container houses the much larger third floor, where the main living spaces such as the bedroom and kitchen are located. Lastly, a prayer room is situated on the fourth floor, which connects to an outdoor patio. 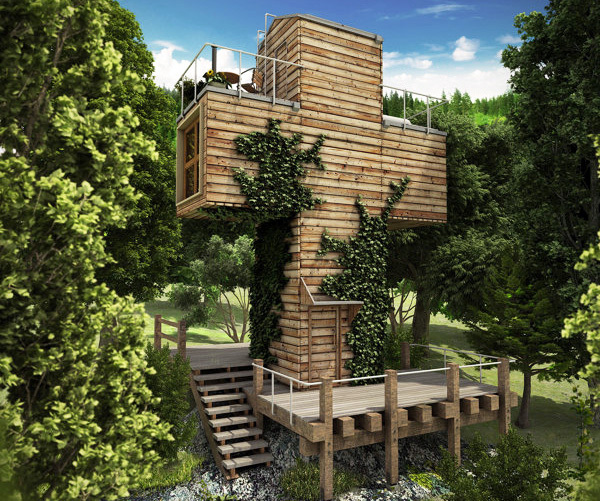 According to Dezeen, Papuashvili plans to construct the first prototype of the micro house by 2015. Built to house a single occupant at a time, the micro house offers a full suite of amenities in a compact energy-efficient space. The wood-clad shipping container structure can be prefabricated off-site to minimize site disturbance. The off-grid building is equipped with solar panels to power the home as well as a rainwater catchment system. The horizontally-oriented shipping container houses the much larger third floor, where the main living spaces such as the bedroom and kitchen are located. Lastly, a prayer room is situated on the fourth floor, which connects to an outdoor patio.